Learning how to knit the basic knitting stitches starts with learning the knit stitch. This one stitch is the magical stitch that makes all other stitches possible. It's also my favorite to knit. When you knit every stitch on every row it's called Garter stitch. And when you learn how to knit you're also learning how to Garter stitch too. I love knitting Garter stitch. Oh I know a lot of people may find it boring, even I do at times. But you know I find that on a particularly long day when I'm tired and don't want to think anymore I'll grab my knitting and just knit plain garter stitch to soothe away my troubles. Of course I have other knitting projects too but on those crazier days I love to go to my simple knitting stuff. This set of photos is the English knitting method where you hold the working yarn in your right hand. It is also called the American, throwing, or right-handed style. To start cast on about 10 to 12 stitches. 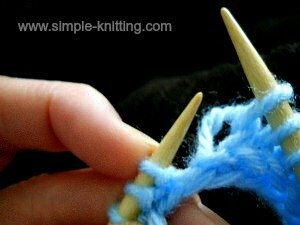 Hold your knitting needle with the cast on stitches in your left hand. Make sure that your working yarn is at the back of your work. Insert the right needle into the first loop on the left hand needle. Push the needle through from front to back. 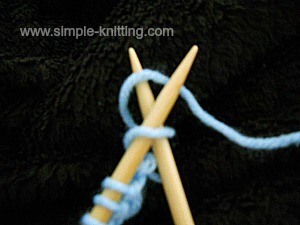 Then with your working yarn, wrap it counterclockwise around right hand needle bringing it in between both needles. Snug it up a little bit. 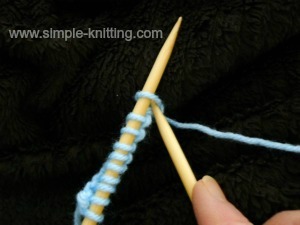 With the yarn still wrapped around the right needle, bring right knitting needle through that first loop on the left knitting needle to complete the newly formed stitch. 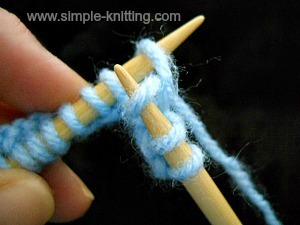 Keep pulling that newly formed stitch through the loop on the left needle. Slowly drop the first stitch off the left knitting needle. It has now been worked. 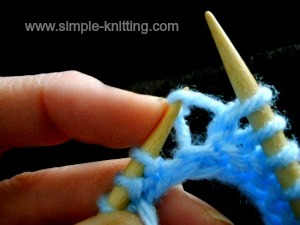 Continue on until you have worked all the stitches on your knitting needle. What do I do when I reach the end of the row? 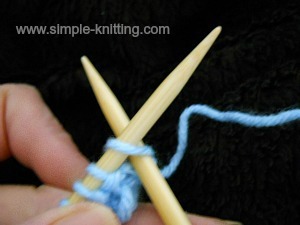 Move your right needle with all the new stitches on it to your left hand, put the empty knitting needle in your right hand and just start over. This is called turning your work. Typically you start off knitting with the right side facing you and then you turn your work and the wrong side faces you and so on. Remember: When you work garter stitch both sides will look the same so you won't really have a wrong side. Actually you'll choose the wrong side. Keep practicing until you feel comfortable with it. I promise it will get easier and more comfortable. I have chosen two excellent videos to help you. The first one is the English knitting method and the second is the Continental knitting method. Grab a cup of tea and have a look. 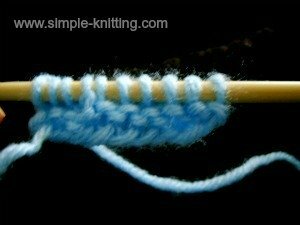 In order to practice the knit stitch properly here's a little exercise. Knit every row until you have a square. Approximately 30 - 40 rows. Note that by knitting every stitch on every row you are knitting the Garter stitch. Bind off all you stitches. Wondering how to cast off? 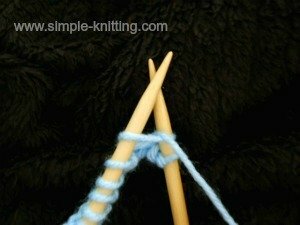 You can learn how to bind off stitches here. Once you have finished binding off make sure to leave about 6 inches of yarn so that you can weave in the ends properly. This way your knitting won't unravel. You have just knit your first garter stitch dishcloth. 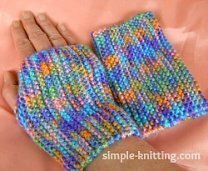 Or if you prefer to practice with an easy knitting pattern try these absolutely beginner fingerless mitts. They're just as simple as your practice lesson above and you'll get way more out of it because you can wear these. 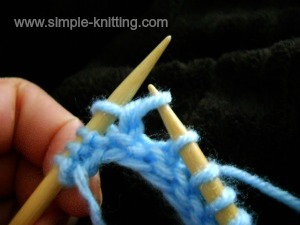 When you're comfortable with knitting you can head on over and learn how to purl stitches.